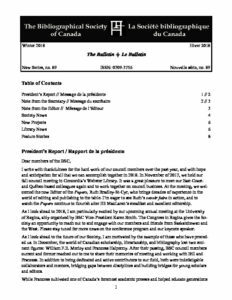 Alexandra K. Carter, our secretary, has assured me that paper copies will be mailed out shortly to those members who have requested them. As a final reminder: the Bulletin is always in search of new content. If there is anything you would like to share in the next issue, please do not hesitate to contact me at bulletin@bsc-sbc.ca.